The Great Silk Road adventure tour takes you a unique opportunity to discover some routes of famous Silk Road in Armenia! During this tour you will explore almost all interesting sites in Armenia and have several overnights in regions. The Silk Road refers to a historical network of interlinking trade routes across the Afro-Eurasian landmass that connected East, South, and Western Asia with the Mediterranean and European world, as well as parts of North and East Africa. The land routes were supplemented by sea routes, which extended from the Red Sea to coastal India, China and Southeast Asia. Extending 4,000 miles (6,500 km), the Silk Road gets its name from the lucrative Chinese silk trade along it, which began during the Han Dynasty. Arrival. Meet at the airport. Transfer to the hotel and overnight. Note: Arrival/departure days will be adjusted as needed according to the flight itinerary of the groups. Day 2: City Tour – History Musiem. Breakfast at the hotel. City Tour around Yerevan- the capital of the Republic of Armenia. Having a history of almost 2800 years, Yerevan is a modern city with high rise buildings, nice cafes and parks. It’s a combination of reach history and a modern lifestyle. Yerevan City was originally designated so that it overlooked the biblical Mount Ararat, and indeed the Holy Mount can be seen from every corner of the capital. You will see all major sights of the capital including Opera house, Republic Square, Kievyan Bridge, Baghramyan Avenue, the Presidential Palace, Academy of Sciences, National Parliament as well as “Cat statue” by famous sculptor Fernando Botero at the Cascade area; enjoy the panoramic view of Yerevan etc. Lunch. Visit the History Museum where artifacts and items from prehistoric time to our days tell us the reach history of the land and its people. Free time when you can enjoy Yerevan lifestyle with evening and night life activities. Dinner and overnight at the hotel in Yerevan. Day 3: Yerevan – Matenadaran – Echmiadzin – St. Hripsime – Zvartnots – Yerevan. Breakfast at the hotel. 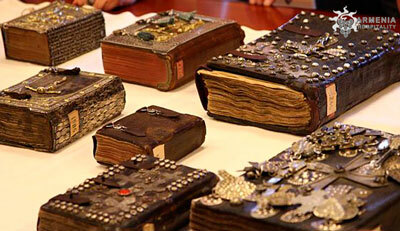 Visit Matenadaran (http://www.matenadaran.am) – is an ancient manuscript repository located in Yerevan, Armenia. It holds one of the world’s richest depositories of medieval manuscripts and books. Departure to Echmiadzin, the spiritual center of Armenia, where the holy seat of Catolicos is situated. The legend has it that Jesus Christ descended from the sky to show the place where he wanted a church to be built. The construction of the church began in 301, the year when Armenia became the first state in the world to adopt Christianity as a state religion. Visit St Hripsime church which is considered to be one of the 7 wonders of Armenia On the way back to Yerevan visit the ruins of the temple of Zvartnots. Zvartnots temple – the pearl of the 7th c. architecture which is listed as a UNESCO World Heritage. Lunch. Dinner and overnight at the hotel in Yerevan. Day 4: Yerevan – Selim Pass – Noraduz – Sevan – Dilijan. Breakfast at the hotel. In the morning depart to Selim Pass to visit the 14th century Selim Caravanserai. 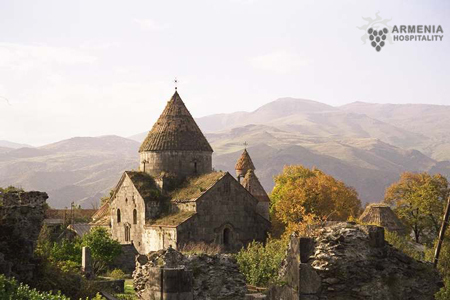 In medieval Armenia many buildings were built along commercial routes for the accommodation of travelers. One of those, the caravanserai of Selim, was built in 1332 by Prince Chesar Orbelian, according to an inscription in Armenian and Arabic. This caravanserai offered hospitality to travelers along the highway crossing the Selim (Sulema) mountains. This building is an excellent example of Armenian secular architecture in the Middle Ages. 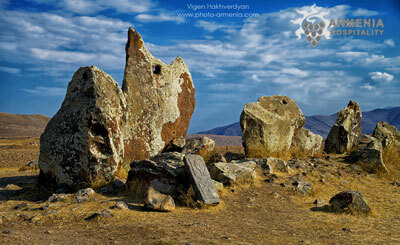 Continue to Noradus to visit the ancient cemetery with numerous Armenian cross-stones (Khachkars). Proceed to the lake Sevan. Visit the 9th century Sevan Monastery located on the peninsula, from where a beautiful view on the lake opens. Lunch in Sevan. Continue to the resort town of Dilijan with beautiful scenery of mountains covered with thick forests. Dinner and overnight at the hotel in Dilijan. Day 5: Dilijan – Goshavank – Haghpat – Sanahin – Gyumri. Breakfast at the hotel. Departure to the magnificent monastery complex Goshavank (12-13th) located in a beautiful site on green hills. Proceed to the Monastic complexes of Haghpat and Sanahin – included in the UNESCO World Heritage List. These magnificent samples of Armenian architecture are located on the picturesque canyon of Debet River. Lunch. Drive to the second largest city in Armenia, the city of Gyumri which greatly suffered from the devastating earthquake in 1988. Dinner and overnight at the hotel in Gyumri. Day 6: Gyumri – Mastara – Talin – Aruch Caravansaray – Yerevan. Breakfast at the hotel. City tour in Gyumri – the second largest city of Armenia. Lunch in Gyumri. Drive to an excellent early church called Mastara (7 c.). Continue to the town of Talin to visit Talin Cathedral (7th century). Proceed to the ancient village of Aruch to visit The temple of Arutch (7 c A.D), decorated with frescos (now seriously damaged) and half-destroyed Aruch Caravansarai (13th century), which is one of the few caravanserais preserved on the territory of Armenia. Dinner and overnight at the hotel in Yerevan. Day 7: Yerevan – Khor-Vira – Areni – Noravank – Goris. Breakfast at the hotel. Departure to Khor Virap, which is translated into Armenian as A Deep Pit. Here in the deep pit Gregory the Illuminator was kept imprisoned for 13 years. But after curing the king from a grave malady he was set free and persuaded the kind to adopt Christianity as a state religion (301A.D.). It is situated in the Ararat valley against the biblical Ararat Mountain, were Noah’s arch cast anchor. You will have a great opportunity to take pictures and enjoy unrepeatable view to the Mount Ararat. Continue to the monastery of Noravank (5-13th cc), erected on a breathtaking site, on brick-red cliffs of Amaghu canyon. It has reach decoration both in internal and in external parts. Lunch in Noravank Area. On the way to Noravank visit Areni wine factory to taste wine made of local grape types. Proceed to Syunik Province to the town of Goris, nestled in the bowl of green hills and mountains. Dinner and overnight at the hotel in Goris. Day 8: Goris – Tatev – Karaunj – Yerevan. Breakfast at the hotel. Departure to the monastic complex of Tatev (9th century). It stands on a plateau on the edge of the deep gorge of the Orotan (Vorotan) River. Tatev was one of the most important centers of Armenian art and science. Visitors easily can get to the Monastery thanks to the longest reversible aerial tramway section in the world (WINGS OF TATEV) which is itself a great attraction, affording panoramic views of the valley below. Lunch. Proceed to the Karahunj (Armenian Stonehenge), an ancient observatory more ancient than that of England. Return to Yerevan. Dinner and overnight at the hotel in Yerevan. Day 9: Yerevan – Garni – Geghard – Yerevan. Breakfast at the hotel. Departure to pagan Temple of Garni (1st c. A.D.), which is a vivid example of Hellenistic culture on the territory of Armenia. Here the ruins of a bath (3rd cent) and a palace (2nd cent. B.C.) can be seen. Garni is located on a deep canyon of Azat river, and from here one can enjoy a panoramic view over the river gorge. Proceed to the cave monastery of Geghard. The spear with which the roman soldier killed Jesus Christ, was kept here and hence the name of the monastery was taken. (Geghard means Holy Spear). This prominent work of architecture, partially carved in the rock, is listed in the UNESCO world heritage list. Lunch. Vernisage open-air handicraft market where you can buy souvenirs in remembrance of your trip to Armenia. In the evening-Farewell party dinner at traditional Armenian restaurant with live music and performance. Day 10: Transfer to the airport. Departure home!